Upon your arrival our reception staff will be there to welcome you and to acquaint you with the hotel's services and amenities. 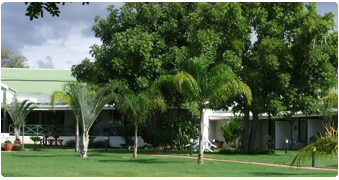 There is a spacious, comfortable lounge area for you to relax in while you plan the rest of your exciting journey, or relax on the veranda which overlooks the azure waters of the Kavango river and the neighbouring village of Calais. There are 20 en-suite rooms, each capable of double occupancy and equipped with a small veranda opening onto lush gardens and sparkling pool with a perfect sun rise view from our eastern side.